Teach your preschooler the letters in his/her name, while working on fine motor skills, with their very own fun and colorful Chicka Chicka Boom Boom Name Tree! We love using children's literature to inspire learning. 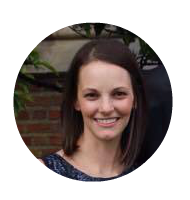 Here is a fun name activity for your preschooler inspired by the children's book, Chicka Chicka Boom Boom! It is also a great way to build fine motor skills. Enjoy! Chicka Chicka Boom Boom is an adorable book for the preschool crowd teaching the letters of the alphabet. It is one of our Favorite ABC Books for Preschoolers. Its playful rhyming storyline makes it easy for kids to remember and partake in "reading," too! 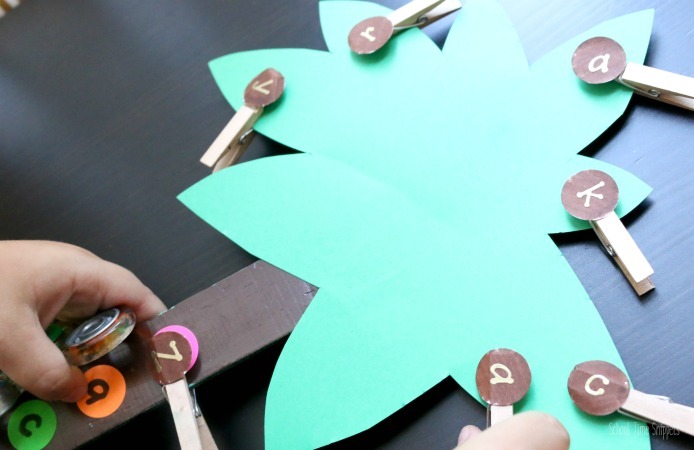 You also might love this Alphabet Craft inspired by Chicka Chicka Boom Boom. Inspired by the fun colors and "every [letter] running to the coconut tree" I created a name recognition activity for my 4 year old. This fun activity will help aid him in learning the letters in his name and putting the letters in the correct order. 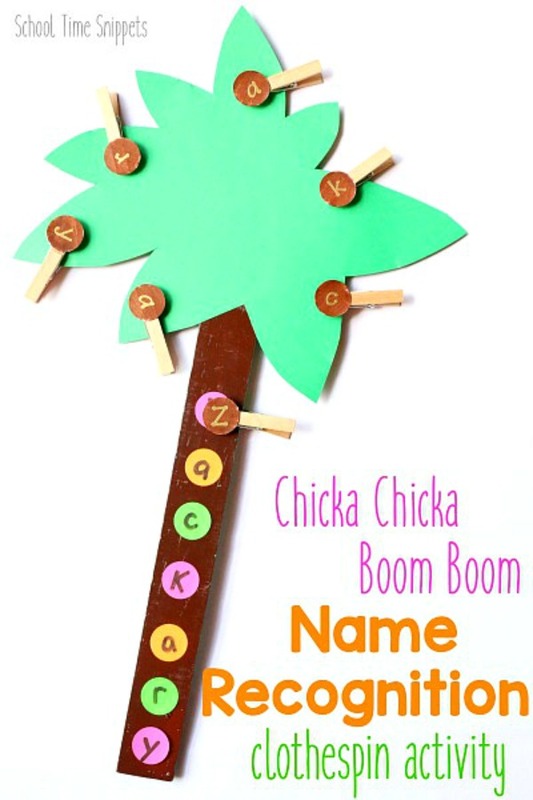 Begin the activity by prepping the Chicka Chicka Boom Boom Name Tree with your child's name. Spray paint or paint the paint stick a dark brown-- this will be the "tree trunk." When the paint has dried, add dot stickers going vertically down the "tree trunk"-- one sticker for each letter of your child's name. On each dot sticker, write a letter of your child's name. Next cut out the greens like a palm tree from green construction paper. Glue onto the top of the paint stick "tree trunk." Now assemble the letter matching "coconuts." I colored white dot stickers with a brown marker. I added a letter sticker to each "coconut." Next, I peeled the dot sticker off and adhered it to the end of the clothespin. If messed with, the lettered "coconuts" did come off the clothespin; to fix this I would recommend perhaps laminating the coconuts and gluing them to the clothespin. 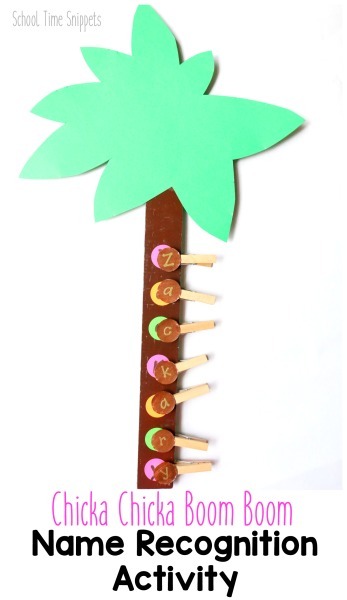 Once the Chicka Chicka Boom Boom Name Tree has been assembled, place the coconut clothespins around the tree. 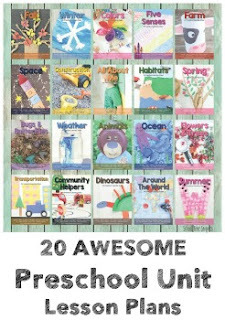 If you have the book, set it out along with this activity to peek your preschooler's interest. Place the activity on the tray and your child is ready to work on name recognition and fine motor skills! Psst... I think clothespins are one of my favorite manipulatives to build fine motor skills; here's 12 Favorite Fine Motor Activities Using Clothespins. 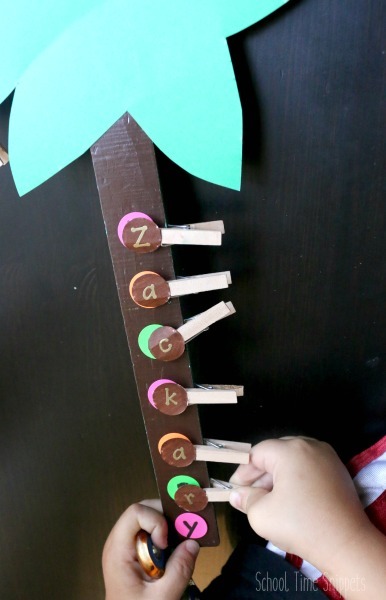 Encourage your child to pinch off a coconut letter from the tree and match it to the letter on the tree trunk. Have your child clip the letters of his/her name in order or allow your child to choose the coconut letter to match at random. This is a great activity to help your preschooler learn the letters in his/her name in a playful, hands-on way!